The quality of Super Bowl ads often rivals the game itself, and yet every year brands will make missteps. Viewers will cringe, be bored, stop watching. 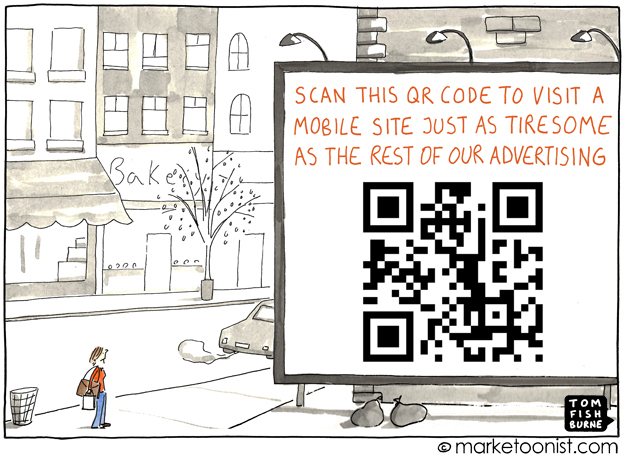 Cartoonist Tom Fishburne sketches out the common stumbling blocks that leave brands writhing in the advertising pit of despair. outlets are talking about the upcoming ads, it seems, than the competing teams (Fast Company‘s guilty on all counts, too). 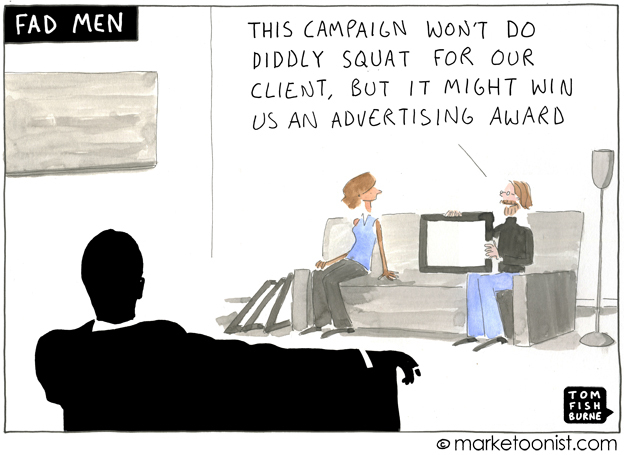 I called on the talents of cartoonist Tom Fishburne to shine a humorous light on the most common ways Super Bowl advertising can go oh so wrong. Special thanks and kudos to Tom’s terrific talent. First, let’s look at what’s working with Super Bowl advertising. Last year’s Volkswagen ad (Darth Vader Star Wars theme) was the favorite, and other automotive manufacturers frantically ripped off VW’s “pre-game buzz” tactics for 2012. According to Kantar Media, the 2011 Super Bowl set a new record for auto manufacturer advertising–a staggering $77.5 million spent on 18 messages for nine different brands. And the 2012 game will have another glut of car ads–Kantar predicts at least eight different auto companies will go head-to-head in the battle of the ad. While the Super Bowl is always the advertising event of the year, this year, it’s also become the social media event of the year. Advertisers are banking that viewers will follow the little screen in their lap just as much as the big one in their living room. Coke is hosting a live game day watching party on Facebook with its polar bears reacting to the Super Bowl and social media in real time. Others have been drip-feeding teasers of their ads on social media for weeks leading up the games. Itʼs a big step from last year, when Audi tried to make a lot of hay out of just using a Twitter hashtag at the end of their ad. The quality of Super Bowl ads, as we’ve seen, often rivals the game itself. As marketers, we should all aim to create marketing so good people choose–and are even eager–to watch. During the Super Bowl, the audience is captive. 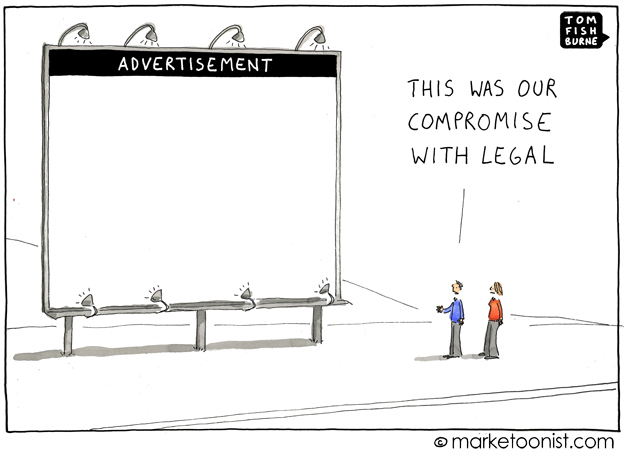 In most of our marketing lives, the audience is anything but. And yet, this year, as every year, brands will make missteps. Viewers will cringe, be bored, stop watching. 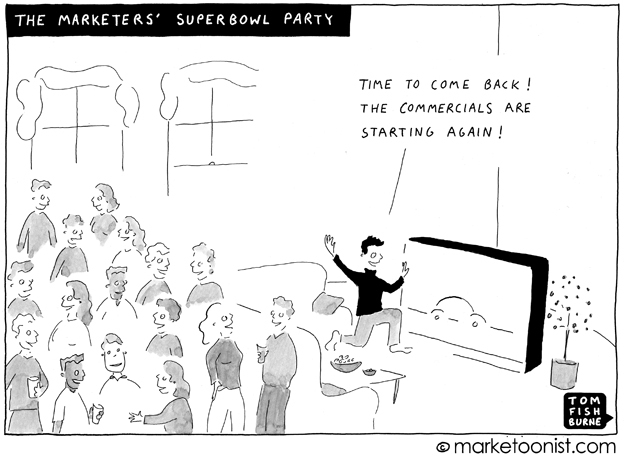 In light of all of this, here are insights designed to help all of us sidestep the hell of Super Bowl advertising. 2. Cannes You Handle the Truth? Advertisers also have a habit of chasing awards over business results. Cannes, Art Directors Club, Clio, One Club, and the list goes on. Companies sometimes aim for shock value over brand value. We can all recall one or two ads that made us (or Don Draper) cringe, thinking, “Who the hell green-lit that?” No list is needed here, you can think of your own examples. remembered. Advertising is littered with ideas that ran the gauntlet between agency and client, only to lose the power of the idea along the way. We are all in business to win with our branding, with our message and with our advertising. The best ads in this year’s race for fame and fortune won’t merely be a sign of creative brilliance. They will signal a deeper creative collaboration between client and agency. The best brands (and advertising) have been a tight collaboration of vision and execution, pushing creative boundaries and connections to remarkable business results. I know that Tom and I are looking forward to Sunday, social media in hand. –This is the first in a series of posts on HELL and escaping its grasp. Stay tuned for upcoming installments including, How to Escape Innovation Hell, How to Escape Social Media Hell, and How to Escape Logo Hell.